Triumph is all set to launch its 2019 Speed Twin in India on April 24. The concept behind the Speed Twin is to combine the Bonneville T120's relaxed riding with the performance of the Thruxton R. Triumph's dealerships across the country have started accepting bookings for the Speed Twin and the deliveries motor-bikes is expected to commence within the last week of April 2019. 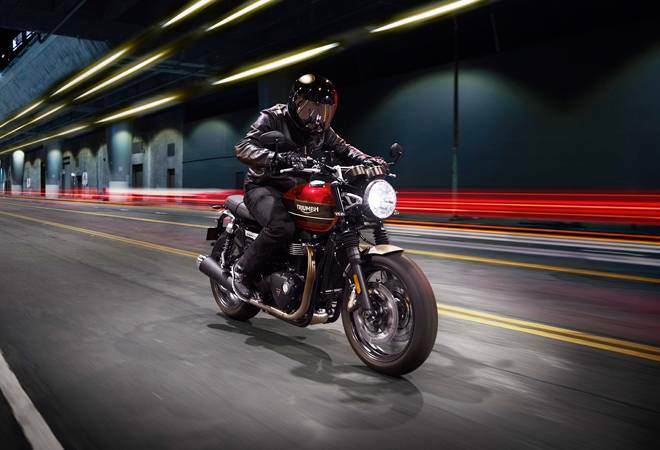 The 2019 Triumph's Speed Twin receives the same 1200cc engine as the Thruxton R. The liquid-cooled parallel-twin motor is based on the Thruxton's engine but the company has used hi-tech materials to decrease its overall weight. Triumph has used magnesium cam covers, new clutch assembly and lightened engine covers to make the engine in Speed Twin 2.5kg lighter than the Thruxton R.
The Speed Twin's engine creates 96 bhp at 6,750 rpm along with a maximum torque output of 112 Nm at 4,950 rpm. There is more than 100Nm of torque available at as low as 2,000rpm, which translates to fewer gear shifts and improves the quality of riding in traffic. The motor is paired to a 6-speed manual gearbox. Triumph Speed Twin, in terms of features, has a neatly designed headlamp, which also integrates DRL, and brushed aluminium fenders over the fuel tank, with hand-painted pinstripes. Triumph, to keep the retro feel of the Speed Twin, has ditched the TFT instrument cluster and went with a beautifully detailed analogue unit. The finish of the bike is inspired by the Triumph's Bonneville range. The Speed Twin also gets safety features like switchable traction control, ABS, and LED daytime running lights along with LED tail lamp and indicators. Additionally, the motorcycle also has a USB slot along with the instrument console with a small digital readout. The price of the Triumph Speed Twin is expected to start from Rs 10 lakh.